State Farm Arena, formerly Philips Arena, opened in 1999 during a time when new arenas began offering more amenities including club suites, premium seating, and more. Check out this blog post about how arenas and stadiums are offering more amenities to keep up with demand of fans who want a premium experience. Since it opened, this facility continues to be home of the NBA’s Atlanta Hawks and the WNBA’s Atlanta Dream. It was also home to the NHL’s Atlanta Thrashers before their move to Winnipeg in 2011. 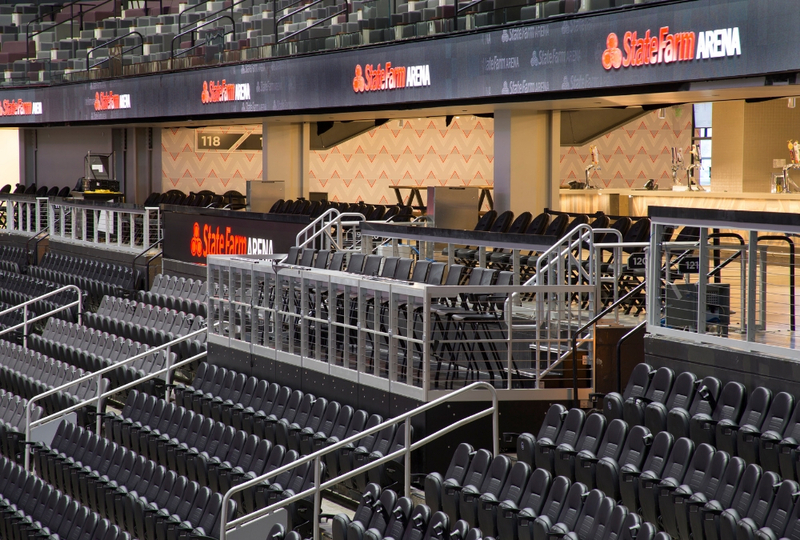 To keep up with the trend of offering a more premium experience for fans, the arena decided it was time to upgrade their facilities to provide reconfigured suites and an event level club area. It was renovated in two phases beginning in 2017. The renovations updated the entire seating bowl including reconfiguring the suite locations and adding premium seating areas including a Courtside Club behind one end of the end-court. To assist in this, they chose StageRight to provide the Telescopic Seating Risers and side-court seating risers. The systems needed to provide a premium look and feel and accommodate seating for the new Courtside Club. The look, feel, and operation of these seating risers was most important because this was going to be a premium seating area where season ticket holders would sit as well. It was imperative that it had the look and feel of permanent seating. 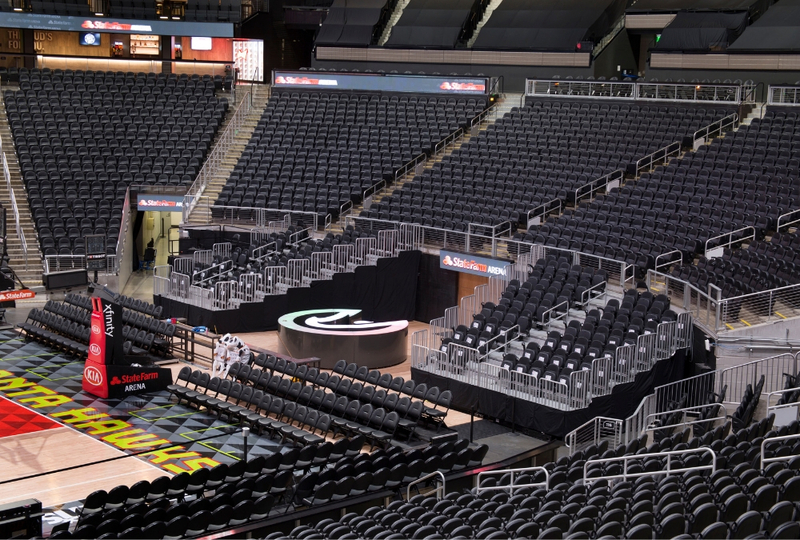 The specific products that we provided for State Farm Arena were our Telematic 100 Telescopic Seating Riser and demountable seating platforms for the entire bowl. When installing these products, we had to work around having multiple trades on the floor at one time because it was a complete bowl renovation. It took a lot of pre-planning and scheduling to make sure everything would be completed at one time. StageRight was able to ship most the of the risers already preassembled to minimize our impact and time on site. Since the renovation has been complete, State Farm Arena has been able to provide an updated premium experience for their fans. The seating risers provided by StageRight have been performing as expected and they’re contributing to the enhanced experience. 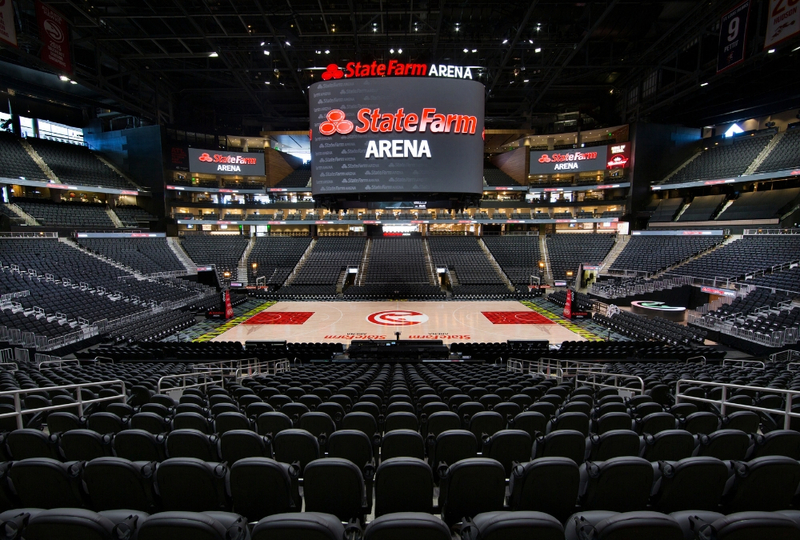 We’re thrilled that we were able to help make State Farm Arena a state-of-the-art facility. We would like to thank everyone at State Farm Arena for the opportunity to work together on this significant upgrade to their outstanding venue.